Opening: Every night at bedtime, Rosie took off her special red cape and hung in on the bedpost. And every morning, she tied it over her shoulders before leaping out of bed to start the day. Synopsis: Rosie arrives at school wearing her red cape and is stunned to see kids on the playground teasing the new girl Fadimata, who is Muslim and wears a hijab. Not all her classmates are being mean, but they seem afraid to stop the bullying. Before Rosie can say anything, the bell rings. She comes up with a plan to help her friend feel welcome. Rosie asks Fadimata if she will make her cape into a headscarf and wears it all day amidst the whisper of the other students. When Rosie arrives at school the next day, she realizes her solution proves that anything is possible and that differences can be celebrated. Rosie is an optimistic, self-confident and strong role model for girls. She’s not afraid to stand up for what is right. If she sees something wrong, she tilts her head, looks at the situation from every angle before she takes action. She’s a superhero for girls. 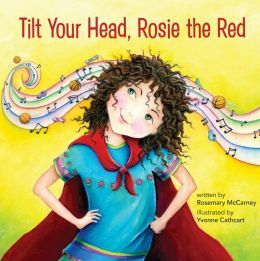 The character Rosie, is based on author Rosemary McCarney, who as a child had and “amazing sense of social justice.” Tilt Your Head, Rosie the Red, is the first of a three picture books starring Rosie the Red. Yvonne Cathcart’s illustrations are colorful and vibrant. They beautifully capture Rosie’s positive and expressive character. This is an inspiring book for home and school. Resources: This is a great character book to use in the classroom. 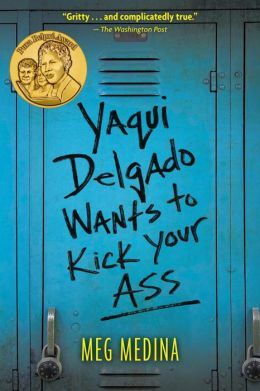 It addresses diversity, bullying, tolerance and the courage to do what is right. Do some role-playing and ask children to walk in Fadimata’s shoes? How would they feel if they looked different and were teased? Have they been teased and why? Have they ever been a bystander and afraid to help someone being teased? How did that make them feel? Is it hard to stand up to their friends? Did they like how Rosie stood up for Fadimata? Rosemary McCarney is President and CEO of the Toronto-based Plan Canada, where she spearheads the Because I am a Girl Movement. She is the author of Every Day is Malala Day and Because I am a Girl: I Can Change the World. Opening/Synopsis: “Hi. My name is Luisa and I have a problem. 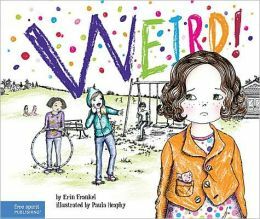 There is a girl in my class named Sam who thinks that everything I do is WEIRD!” When Luisa raises her hand to answer a question, tells a joke to her friends, hugs her mom after school, or wears her favorite polka dot boots, Sam says she’s WEIRD. Luisa tries to change what she does, but Sam continues to call her WEIRD. Luisa doesn’t feel like herself anymore. “Everyone misses the way I used to be. Everyone else, including me.” After talking with her mother, Luisa makes some positive changes and throws Sam a curve ball. Opening/Synopsis: “Hi. My name is Jayla and I’m scared. See that girl? That’s Sam. She’s tough. She picked on me a lot last year, but I never stood up for myself. 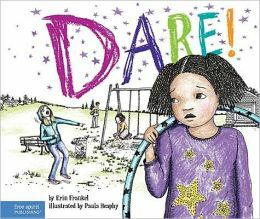 I didn’t DARE! No one stood up for me, either. They didn’t DARE.” Jayla is relieved when Sam stops bullying her, but feels bad when she sees Luisa the next target. Jayla remembers too well how it feels when no one dares to stand up for her. Even though Jayla tries to mind her own business, Sam begins to DARE Jayla to say mean things to Luisa. Jayla is scared and caves into Sam. Jayla feels bad for Luisa. “This isn’t the kind of person I want to be.” Jayla musters the courage to make her own DARE and reclaims her power from Sam. Opening/Synopsis: “What are you staring at? I’m not the weird one. My name is Sam and I’m TOUGH! That Luisa. She’s weird. She dresses weird. Acts weird. She talks weird. Someone has to tell her, so I do.” Sam has had a lot of practice learning to be TOUGH. Her brother bullies her and she’s had to learn to stand up to him. Sam acts tough so people won’t mess with her. She discovers that people aren’t following her rules anymore, so things are getting a bit tough for Sam. 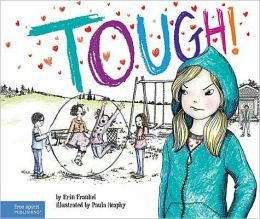 Her teachers want to help her, but is she through with being TOUGH? 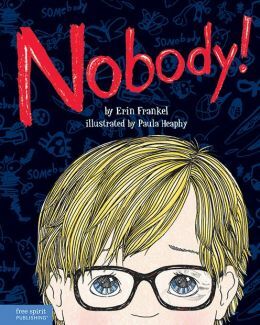 Why I like this series: Erin Frankel has written a very powerful series on bullying. The Weird Series shows kids bullying from three different points of view: Luisa who is bullied in WEIRD!, Jayla who is the bystander in DARE!, and Sam who is the bully in TOUGH! The books can stand-alone, or be used as a series. I recommend that classrooms read the books as a series because the stories are interwoven. Readers will identify with the name-calling, insults, threats, fear, and anger. The characters are realistic and the language is simple, but edgy. These books are going to be hits in the classroom. Paula Heaphy’s black and white illustrations are highlighted with splashes of color, usually focusing on a specific character. They are bold, emotive and capture the great body language of the characters. Resources: Each book has extensive pages of backmatter for kids, parents and teachers on the topic at hand (i.e. victim, bystander and bully). There are summaries of lessons learned, discussion points, activities, suggestions for courage, confidence and kindness clubs, and role-playing. Visit Erin Frankel at her website. Teachers can download a free Leader’s Guide from Free Spirit Publishing. The following is an interesting interview with both author and illustrator that I believe you will find interesting. These books have been provided to me free of charge by the publisher in exchange for an honest review of the work.